The story of the Navajo code talkers is now well known, but the first use of “code talkers” occurred in World War I, when Choctaw speakers were employed. Thanks to the movies, the story of the Navajo code talkers is well known, but truly misunderstood. The surviving code talkers are telling their story, but one part of the tale that is not fully told is that the Navajo were not even the first Native Americans to be selected as “code talkers” for their unique language abilities. In fact, the first use of “code talkers” occurred a generation earlier during World War I, when the American Expeditionary Force used Choctaw speakers with some success in the late war campaigns against the Germans. A generation later, the United States Marine Corps again considered using less commonly spoken languages along with a code as a way of relying messages. One suggestion was actually not even native to America at all; it was based on the language from the Basque region of Spain. The down side to this was that there were many Basque speakers living in China and the Philippines, and even a colony of Basque Jesuits in Japan. This fact, along with the shortage of those who could actually speak the language in the United States, resulted in the Marines focusing their linguistic programs on other languages. The Nazis had known about the use of Choctaw speakers in World War I, but the diversity and sheer number of Native American languages made it difficult for the Germans to successfully combat this threat. 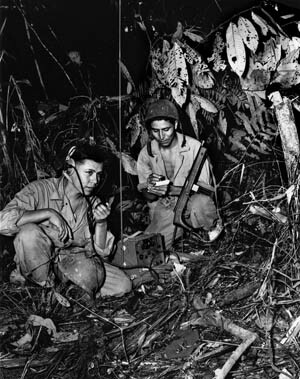 Regardless, the use of Navajo code talkers in Europe during World War II was still limited as a result, with the U.S. Army using just slightly more than a dozen Comanche code talkers with the 4th Infantry Division. Why the Navajo Language in WWII? The U.S. Marine Corps chose the Navajo language on the recommendation of Philip Johnston, the son of a missionary, who was one of the few nonnative speakers of the language. The Navajo language was ideal as it was unwritten, extremely isolated, and, most importantly, had a very complex grammar. The first 29 Navajo recruits to the Marine Corps were charged with creating the Navajo code, which they did in 1942 at Camp Pendleton, California. But it was not merely translating English to the language. Instead, a unique code was developed, making it even harder for the enemy to understand any communication, even if they managed to translate it. After World War II, the Marines continued to rely on Navajo code talkers, and their language was used during the Korean War and in the early part of the Vietnam War. It was finally released to the public in 1968, when it was officially declassified. Hopefully, through the words of the surviving Navajo code talkers, the truth will be revealed. More importantly, the Navajo Code Talkers Foundation has a vision to establish a museum that would continue to tell the story even after these men are gone. This is the Navajo Code Talkers Museum & Veterans’ Center Project (www.navajocodetalkers.org). Scheduled for completion in 2012, the museum will help tell the story of these men, who were little more than teenage boys when they enlisted during World War II. But it was these boys, serving alongside many others, who helped win the war in the Pacific. Tags China, Choctaw, Europe, German, Japan, Korean War, Navajo Code Talkers, Nazi Party, Philippines, South Pacific, United States, United States Marine Corps, Vietnam War, World War I.